Those who collected the brand last year will notice some differences in 2014 Panini Prizm Baseball. While the overall chromium look and feel is largely the same, the set boasts a new configuration that might deliver few cards overall but more of stuff most collectors loved. The number of packs per hobby box has been cut from 20 down to 12. Despite the smaller number, there are still two autographs. 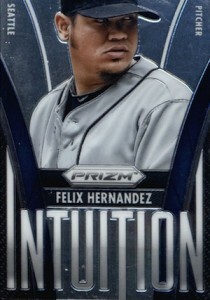 Prizm parallels have doubled from three in 2013 to six. 2014 Panini Prizm Baseball adds more color to the parallel mix. Those available in hobby packs are Silver, Purple (#/99), Blue Mojo (#/75), Orange Die-Cut (#/60), Jackie Robinson Tribute (#/42), Red (#/25), Gold (#/10) and Finite Black (1/1). Jackie Robinson Tribute, Gold and Black are all hobby exclusives. Of the six Prizms per box, half of them are serial numbered versions. Protect your 2014 Panini Prizm Baseball cards with Ultra Pro toploaders. One of the knocks against 2013 Prizm Baseball was the prevalence of sticker autographs. 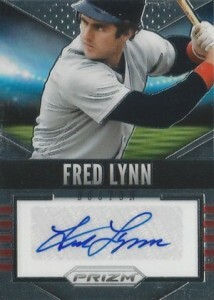 One of the autographs in every 2014 Panini Prizm Baseball hobby is hard-signed. This includes several big-name veterans and retired players like Mike Trout, Ken Griffey Jr, Greg Maddux, Tom Glavine, Mariano Rivera, George Brett, Pete Rose, David Ortiz, Cal Ripken and Buster Posey. Veteran and Rookie Autographs include several Prizm parallels: Silver, Purple (#/99), Mojo (#/75 or less) and Gold (1/1). Signature Distinctions is where a lot the retired players enter the mix. All four levels of Prizms for these are die-cut and numbered to no more than 99. The ten-card list includes Griffey, Rivera, Bo Jackson, Frank Thomas and Nolan Ryan. 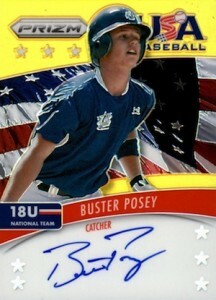 USA Baseball Signatures highlights national team alumni. 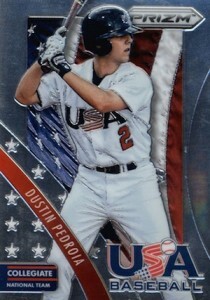 The ten-card set features Clayton Kershaw, Evan Longoria, Dustin Pedroia, Max Scherzer and Eric Hosmer. Sticker autograph signers (they haven't been completely exorcised from the product) might not all be superstars, but some of them haven't signed a ton in recent years. Steve Sax, Rusty Greer, Rick Monday and Ron Gant fall into this category. While much of the attention in 2014 Panini Prizm Baseball will be on the parallels and autographs, the product does have a lot of basic inserts as well. These include Chasing the Hall, Diamond Dominance, Golden Leather Die-Cut, Intuition, Next Era, Rookie Reign and USA Baseball. Collectors should find one of these every other pack. Good: Lots more color, simplified structure and distribution, on-card autographs. Bad: Too many basic inserts, dust pain to clean off. 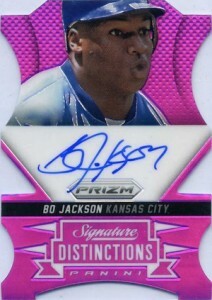 The Bottom Line: It’s nice to see Prizm evolving. Last year, it was bland, weighed down by not enough color on a per-box basis and a daunting structure for the various hobby- and retail-exclusives. The smaller box configuration is a good one. When you work it out to price per card, it’s not any cheaper than last year but it’s a lot easier with the smaller box and smaller price. It’s also much more fun with the better Prizm parallel ratio. Add to that more on-card autographs and 2014 Prizm Baseball is easily the most exciting for the brand since it was introduced in the sport. 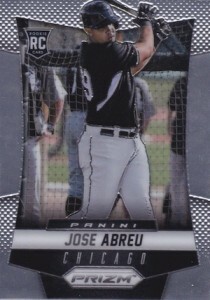 The changes in the 2014 Panini Prizm Baseball base set are largely cosmetic. It looks very similar to what it did in the 2012 and 2013 sets. The borders are a little thinner and all the written info has been brought together. This allows for a little more photo space but not much. In a couple of years, it will be tough to tell the sets apart at a quick glance. What that points to is a need to overhaul the design. It needs something different. Panini has proven with their off-shoot Prizm sets like Select and Crusade that it’s possible to depart greatly, have brand continuity and still work to the chromium stock’s strengths. 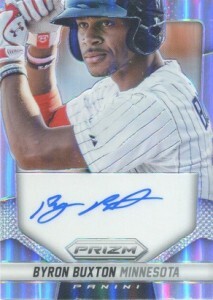 The 2014 Prizm base set doesn’t look bad, it’s just getting tired. Where the set excels is with the parallels. Rather than simply adding more colors, Panini is throwing more intricate patterns into the mix. While names like “Mojo” might not appeal to me, there’s no denying they look great. 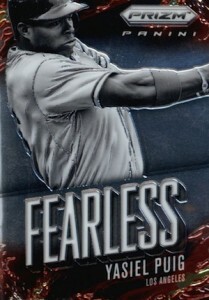 More of this will help Prizm differentiate itself from the Topps Chrome and Bowman Chrome lines. The etching is also another way to set them apart. If you haven’t already, take any Prizm parallel and get some good light on it. The way the edges burst is fantastic. The other big leap for this set is the larger number of on-card autographs. One of my personal pet peeves in the hobby is sticker autographs on chromium stock. I don’t like stickers to begin with but sometimes they can work. They never do when they’re simply applied to a chromium card. 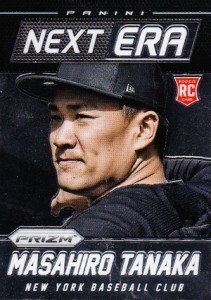 2014 Panini Prizm isn’t all on-card, but there’s a huge step in that direction and that’s a good thing. Last year, the number of Prizm parallels and the types of packs they were in was confusing. And while there was plenty of color to be found, the average hobby box didn’t have much. Perhaps the biggest improvement for 2014 Panini Prizm Baseball is the change in this area. There are still lots of levels of parallels. But they’ve been simplified. Also, even though hobby boxes are smaller, the number of Prizms per box has jumped. My biggest wish for the set comes from the basic inserts. For starters, there are too many of them and most of the themes simply aren’t compelling. Throw in the many parallels for each, and I have a hard time getting excited about them. I’d suggest getting rid of nearly all of the basic inserts except for maybe the USA Baseball cards (they’re some of the sharpest in the product). There’s enough variety in the Prizm parallels to keep a bust exciting. And let’s be honest. Are there many collectors out there chasing Intuition or Diamond Dominance other than to build a master set or chase their player? My guess is no. The autographs seem to have a lot of young players, but there also seems to be more stars coming out as well. I look at the signed cards as something of a bonus with this set, a secondary focus. As a result, the sting of getting a couple of scrub signatures shouldn’t sting nearly as much as it would from a high-end hits-focused product. It’s almost like 2014 Prizm Baseball is like a premium hobby blaster. The $50-ish price is a lot easier to come up with than the $100-ish last year’s set initially ran. For those who can swing the bigger price tag, go for two boxes and spend roughly the same amount but end up with double the autographs and Prizms. For those on a tighter budget, it takes out the risk of buying a pack here and there where the fancy stuff might already be gone. But $50 would be too much if the product didn’t deliver. Prizm does, especially for something at a limited price tag. 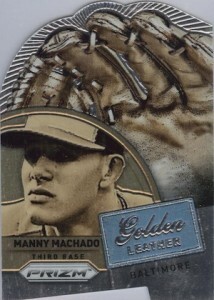 Some collectors will ignore it simply because it doesn’t carry the MLB logos, which is too bad. A lot of sets, that sticks out for me. Here I forgot all about the lack of logos until I was about two-thirds of the way through. And even then, it didn’t matter. 2014 Panini Prizm Baseball was a blast to open. It improved on so many of the areas that I thought were weak last year and comes in at a much more manageable configuration. Is it perfect? Not yet, but it’s easy to spot the improvements. The dust that’s on the cards is annoying. It made handling them weird and I didn’t want to leave it on either. I like the idea of spending more time looking over a card, but being forced to in order to wipe them down one at a time with a soft cloth isn’t ow I want to go about doing it. If it protects the cards from scratching during the printing process, that’s good. But it would be good if they were cleaned off mechanically before they went into packs. 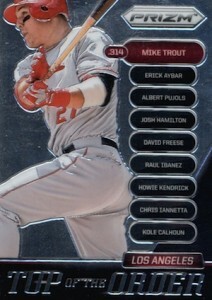 Panini has struck a nice balance this year with Prizm Baseball. It’s more colorful but easier to figure out. That one change makes it a lot more enjoyable over last year. Add the other improvements and you’ve got a product that’s poised to become the company’s cornerstone baseball brand (if it isn’t already). 2014 Panini Prizm CAL RIPKEN JR DIAMOND DOMINANCE GOLD PRIZM REFRACTOR SP #6 10! Are these going to be available in retail? Isaac � Not sure. Would suspect so but likely a different configuration. Lower price point, lots of numbered color and a much better auto list than in previous versions. The MLB license would help, but even without this is a great product in my eyes. I have always loved Prizm, in any sport. Against my better judgement, I bought a box. Every single card had a thick layer of powdery film on them. My hands and the table I was opening on were covered in this stuff. It was a mess. It is one thing to be non licensed, which is not good for cards, but it is another to sell your product like this. For the first time, I hated the Prizm product. Will give the whole box away to charity or something. When we would chase autographs as a kid certain cards were slick..so when signed the autograph wouldn’t be complete ie had missing links between the signature. What we did to alter this process was put baby powder on the cards and wipe them down so the surface was better for the players to sign. Nothing new since we had been doing it since the early 90’s! It’s just now people are worried about making money on their “investment”! To many people worried about making a buck then collecting! Blowmans, I don’t know how old you think I am but I have been collecting since 1978. I have never run into cards with this much residue as I did with 2014 Prizms. I collect. I have never once sold a card or tried to make a “buck” out of them. I don’t want these cads because they make a huge mess. I don’t want all this stuff on everything in the house. Cleaning every single card is too much of a hassle. So if you want to collect these cards, be my guess. David, if your really that concerned about them making your house dirty then I don’t know what to say but open them outside? And it takes 10 seconds to wipe a card down front in back..I’ve yet to open any of this product but has every single box had this problem? 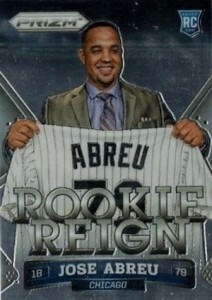 This products inserts look 10 times better than any in bowman. 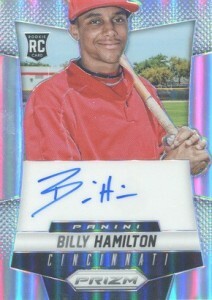 And have nicer autographs per the checklist then anything besides prospects in Bowman or any Topps product. Ill still stand by trinity as being the best product on the block. And it’s refreshing to hear someone actually keeps their cards but I hope you understand my point of what the so called “hobby” has become…which is rip and sell. I mean when people are asking $5k for a redemption card of a player that’s not even taken a swing in the majors..it’s become a business and not a hobby! Blowmans, I do 100% agree with the way the hobby has gone. There was a time when time actually was an ally to card value. In the last 10-15 years, the value of these cards are best at the beginning and then they go down. People are so A.D.D. now. As for this stuff, I did not say they don’t look good, they do. Also, if I wipe each and every one of them, that 10 seconds becomes a long time. Also, the stuff is so prevalent that it goes from the cards to other things. The table, chair, clothes. it is like a nightmare. Look, if you want the box, give me your address and I will be very happy to send you the whole thing, un-wiped and all, with every insert. The last three iterations of this product have been the only sets I’ve collected in 15 years as they’re really some of the most striking cards I’ve seen. Doing mixed parallel master sets really harkens back to the glory days of the mid 90’s inserts for me. The higher quality plastic top layer of the laminate just gives it that extra brightness to really catch the eye and allows for some of the most beautiful colors and refraction; just good old plain fun cards to have. 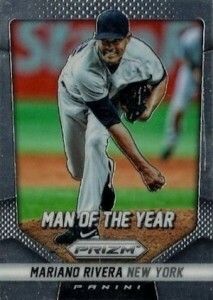 The ’12 father’s day and convention parallels and ’13 pulsar inserts are really really great looking cards. Can’t wait until the parallel lots get a little more affordable for this years to see them. Even with a tight budget you can have great looking sets so if anyone finds themselves in need of getting rid of theirs I can definitely give them a good home! (ie. feel free to get in touch if you want to unload parallel lots from any year, though I’m certainly a ‘value’ buyer). I have never bought Prizm until last year. 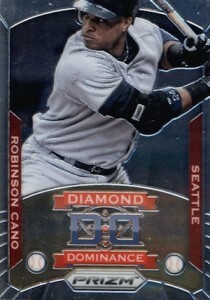 Liked them but not the same as MLB licensed cards. I always buy a Blaster box from W/M or Target first to see if I like them before buying hobby or jumbo boxes. Every card (including the Camo Prizm bonus 6 pack) had no gloss on the backs. Looked terrible , cards are useless. I buy cards to have them graded, I got a couple of cards I would have graded but not now. I’ll buy another one hopping this one was a bad print run. Ok, I didn’t read all of the remarks above. I didn’t know about the powder. I just pulled one of the cards I put in a sleeve and now it has a glossy surface. I guess its not that big of deal to wipe off the ones going into a top loader, other than possibly damage to the corners doing so. Tell me why I shouldn’t give this item a 5/5…. Im not saying its likely to duplicate this kind of luck with this set. But as for myself this is hands down my favorite product 2014…. I have just started getting back into collecting and this product has been my favorite with all of the excellent cards and everything it offers. I do have one problem though just mostly confusion really. Why do I have some cards that are base and then some or the refractor and I’m not saying the parallels like red and purple or the others its just a basic refractor. Is it just the base card or is it a Prizm Prizm card. Sorry I feel like I’m asking a dumb question haha but just kinda confused? Jared � Basic refractors are another parallel — the easiest ones to get.